The Album Of The Day is "Beneath A Dying Sun " by Thalamus. "The thalamus is defined as "the brain region that serves as a switching station for sensory signals channeling from the brain stem to other brain regions, and is closely related to the function of consciousness." The reason I preface this review with this technical definition is that the band THALAMUS is truly "the musical switching station for channeling old-school heaviness to your ears, and is closely related to the function of your mind being blown." Just as the biological function is well-defined, so is the musical function of this band. These guys are of one mind...and it shows on every single track. This riffmachine rolls in bone-crushing overdrive from the first note...the only release from the pummeling assault only happens between songs. 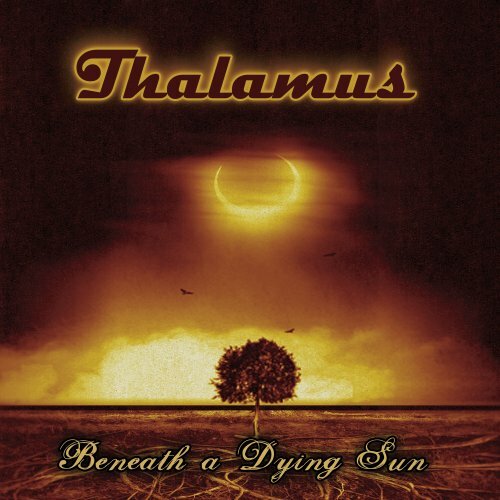 The THALAMUS vibe casts dark influential shadows reminiscent of Black Sabbath, Budgie, Camel and early Soundgarden, but the granite-hard amalgam that casts the shadow they've created projects their own unique shape...again, well-defined - in the extreme. One very cool and uncommon aspect of these arrangements is that the bass guitar and drums move from the position of foundation to superstructure - the lowdown, riff-heavy, split-channel groovaciousness of guitarists Kjell Sjostrom and Jan Cedarlund is super-glued to bassist Peter Johasson's figures and Sebastian Olsson's syncopated mind-meld drumming...they think and act as one...capturing that true retro-70s vibe of "all for one, one for all". Kjell's vocals are of particular note...live and strong, passionate and bluesy...totally resonant with the bone-crushing grooves. His delivery is lyrical, emotionally heartfelt and delivered from WITHIN the songs...not afflicted by "skating" on top of them (as so many of their so-called contemporaries consistently suffer from). The last two tracks - "Too Stoned" and "Falling" - artistically cap this outing with a fabulous "tune-tie" that starts heavy and immediate and ends airy and reflective. These two tracks should be the "know your dose" mantra - beautiful...and terrifying..truth. No studio trickery is present in this mix - it's totally in your face, very loud and very clear. It may sound like a paradox, but this clarity is REFRESHING...no chorus, delay, flange, boosters or ProTools trickery...a pure and unaffected sonic assault, save for the careful micro-fine-tuning of EQ to drill the grooves down to bedrock - hard and tight. Just listen. You'll know what I mean.